Unyson Page Builder – Keynote app-like interface, So anyone can create beautiful page easily. This Content Builder includes lots of features which you can change a lot easily. Easy to Use Keynote-like interface – Page builder with keynote app-like interface. Clear overview content inspector. Drag & Drop Page Builder – Create your multiple layouts in a single page without touching theme code by dragging and dropping our various pre-defined content modules including gallery, blog, testimonials and etc. Let’s try the powerful built-in builder. Save as Template – Page can be saved as template in order to apply to new pages. This saves time to develop new page. Fully integrated with WordPress Customizer – Modify Appearance settings in a live preview. No matter what you change elements colors, background, typography, layout type, text or images, you will see the results instantly. Theme Variations – We have two impressive theme variation with color now! 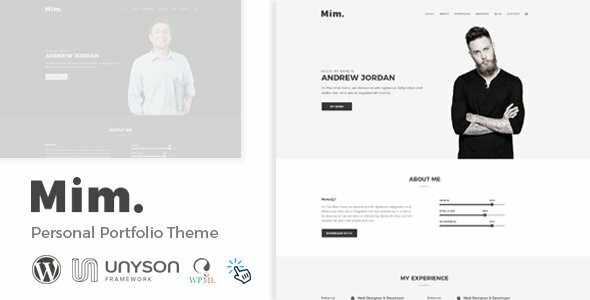 Extensive Theme Options – Mim theme features an exceptionally organized/designed options panel that provides you with fully control of your theme. SEO Optimized – Care was taken when coding Mim theme and search engines will appreciate it. Translation-Ready – Mim theme includes the .pot files and is ready to be translated into your desired language. * Menu Problem solve (Now menu works on every page) - Bug fix. * Translation file update (POT) - Updated. * Optimized code to speed up - Optimization . * PHP Fatal error solved ( Cannot redeclare _action_hide_extensions_from_the_list() ) - Bug Fix. * Portfolio single (details) page added (New Feature). * Builder description section HTML code support (Updated). * Optimized code to speed up (Optimization). * Portfolio shortcode style switcher added. * Menu and portfolio filter text strike through controller added (New Feature). * Builder section color change option added (New Feature). * Added Two new section shortcode (New Feature). * IE-10 JS error problem fix (Bug fix). * Fix menu style issue (Bug fix). * Builder section targeting ID added (New Feature). * Added custom widget (New Feature).